Due to unforeseen circumstances, announced capuiera instructor Mestre Banana won't be able to lead this year Capoeira workshops within in the Days of Brazil festival.... 14.August.2013. Sports and recreation club "Capoeira Senzala" from Novi Sad will gather visitors from the region and across Europe to attend free Capoeira workshops... 12.August.2013. We would like to inform you that all the places for the Brazilian Shake and Samba dance workshops are booked. Workshops will be organized in the hall of dance school Allegro ... 10.August.2013. Saturday Night - We are Celebrating visa abolition for Brasil! Saturday August 17th is a great day to celebrate in Serbia and Brazil! If you wanted to swim at Copacabana beach, or try out carnival samba, drink famous Caipirinha,... 14.August.2013. Dear participants, we would like to inform you that, for this years’ festival, we have organized accommodation in class A dormitories. 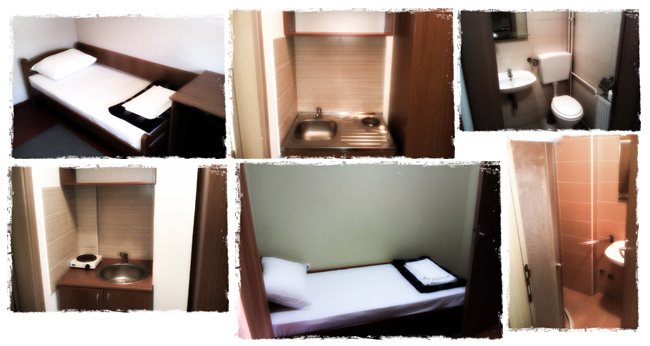 All rooms are twin-bed rooms with bathroom, kitchen and free wi-fi. Dormitories are located at Bulevar Despota Stefana 7a, near city beach “Strand”... 24.July.2013. As a part of the festival 'Days of Brazil – Novi Sad Samba Carnival', FREE Capoeira workshop, for the 4th time, will be held in Novi Sad, at Strand beach from 16th – 18th of August! ... 04.June.2013. Days of Brazil – Novi Sad Samba Carnival will be held for the fourth time form August 16 to 18th on various locations in Novi Sad. Due to that we are inviting all interested people to apply for the workshops on begginers and experienced level... 30.July.2013. At the invitation of the Brazilian Embassy in Serbia, "Sambansa" participated in the 35th International Tourism Fair in Belgrade. Presentation of Brazil as a tourist destination was complemented by hot rhythms of samba percussions and in a very short time the Brazilian embassy stand has become the most visited at the fair... 30.March.2013. At the invitation of the Brazilian Embassy in Serbia, "Sambansa" samba school from Novi Sad participated in the 35th International Tourism Fair in Belgrade. Presentation of Brazil as a tourist destination was complemented by hot rhythms of samba percussions and in a very short time the Brazilian embassy stand has become the most visited at the fair. This was also an opportunity to present the fourth annual festival "Days of Brazil - Novi Sad samba carnival" to the Ambassador of Brazil in Serbia, His Excellency Alexandre Addor Neto. The Ambassador expressed his satisfaction that the festival is growing every year and that, with mutual cooperation, we are presenting the Brazilian culture in the best way. As a part of the festival 'Days of Brazil "Novi Sad Samba Carnival", FREE Capoeira workshop, for the 4th time, will be held in Novi Sad, at Strand beach from 16th - 18th of August! Besides people who already practice Capoeira, anyone can join the workshop (children from 4 years of age and older) who would like to try something new, meet new people and socialize. Everyone is welcome, regardless of the Capoeira group they are coming or whether they practice Capoeira or not. In addition to classical techniques and fights, all the other aspects of Capoeira will be taught at the workshop: music, acrobatics, samba, maculele and oral lectures. Participants have the opportunity to be a part of the Carnival parade (if they choose so), which will be held on the last day of the festival, August 18th, 2013 and in that way show their newly gained skills and enrich our "traditional" Carnival parade. Capoeira workshops are organized under the wing of Grupo Senzala (Centro Cultural Senzala de Capoeira), one of the biggest Capoeira groups in the world. This capoeira workshop is organized by club "Capoeira Senzala" from Novi Sad. So far, Mestre Steen has confirmed participation at workshops. The names of other trainers as well as applications for the workshop will be announced soon. We would like to inform you that, for this year’s festival, we have organized accommodation in class A dormitories. Price for accommodation is 15e per person for one night. You can apply for accommodation by clicking on this link. If you wish to reserve your accommodation by yourself, we would be more than happy to give you any assistance you need. We would like to inform you that all the places for the Brazilian Shake and Samba dance workshops are booked. Workshops will be organized in the hall of dance school Allegro located at Trg Marije Trandafil No.14. On Friday 16th Aug. and Saturday 17th Aug. from 17 till 19h, and on Sunday 18th Aug. from 12 till 14 h.
The workshop will start with a little introduction and warm up with, Lúcio Lopes, brazilian born Ponte Nova / MG. 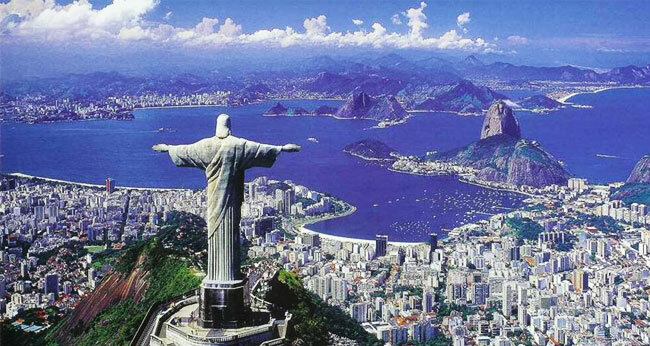 He came to Europe in order to expand globally and assist in the expansion of Brazilian culture. He has over 16 years of experience in Capoeira and 10 years of experience in dance. He has conducted workshops, concerts, and participated in events in several countries such as Hungary, Serbia, Austria, Russia, Croatia, Montenegro. After an introduction, you will meet Yazzmin Alice Newell a dancer and a teacher from London. She has been dancing Samba for five years actively. She was the Rainha da Bateria untill 2013 for London School of Samba and is the current Queen of Carnival for Brazilica festival in Liverpool. She has performed all over the world as a dancera and a percussionist. She performed from Hong Kong to Brazil where she stayed for a month touring Rio with Rhythms of the City and performing with well known bands: Monobloco and Sargento Pimenta. She has taught samba at well known Latin club Bar Salsa in London with Element Dance. As well as being a great dancer Yazzmin has a good knowledge of samba as a musician which brings an different viewpoint when it comes to expressing the rhythms through dance. As well as teaching samba, Yazzmin has knowledge of other Brazilian styles which she likes to bring into her choreographies and teaching, to keeping things fun and interesting! We would like to inform you that the Quadrilha workshops will be organized in the hall of dance school Emigrantes located at Kosovska No.4. On Monday 12th Aug from 14 till 19h, Tuesday 13th and Wednesday 14th from 19 till 21h 17th Aug. To participate in the workshop, you just have to show up at the workshop at the given address at the appropriate time. All workshops are free of charge. These workshops will be held by charismatic Naiara Lira. 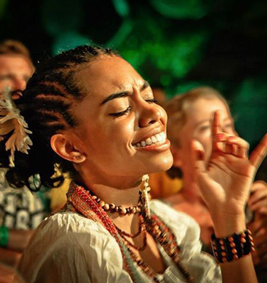 She is a singer from Brazil that came to Serbia for the first time in 2012 to perform samba, choro and forró. This year she decided to bring a little more of the cultural richness of the country in the form of a country wide dance. The Brazilian “Quadrilha” has its name from a French dance hall for four pairs, the “quadrille”. It came to Brazil following the interests of the Portuguese and Brazilian middle class and elites, on XIX century, by whatever was the latest Paris fashions. Throughout the XIX century, the “Quadrilha” became popular in Brazil and merged with other Brazilian dances gradually losing French steps and rhythms. This is a dance that had its greatest flowering in rural Brazil, and became a dance of “Festas Juninas” (Celebration days of St. John, St. Anthony and St. Peter), mainly in the Northeast of the country. Since then, Quadrilha leads the June festivities in the entire country including schools, during which time schools make special programs to teach children how to dance and a presentation is made during local parties. Days of Brazil Festival is looking for volunteers! Festival Days of Brasil - Novi Sad Samba Carnival for the forth year in a row will introduce people from Novi Sad to diverse Brazilian culture trough capoeira, samba percussion and samba dance workshops, cultural programs and warping it all up with a Carnival parade. Program of this festival will run from August 16 to 18 on various locations – Cultural Center of Novi Sad, Petrovaradin Fortress and Strand beach. Since number of visits of this festival is being higher each year in 2013 we are expecting the highest number of people including a lot of visitors form abroad. If you are interested to help out in organizing this Festival and by doing so socialize, meet new people. learn and gain valuable experience – come to be a part of our Volunteer Team. Volunteer duties will include hosting of foreign participants (showing them the venues for sleeping, eating, in general hanging around with them), helping with samba percussion workshops and in the organization of Carnival parade. In order to apply you need to fill out and send the application form on the web site on August 10th the latest. We are looking forward for you to join us! Days of Brazil – Novi Sad Samba Carnival will be held for the fourth time form August 16 to 18th on various locations in Novi Sad. Due to that we are inviting all interested people to apply for the workshops on begginers and experienced level. The two samba percussion workshop leaders again this year will be Ricardo Pereira Cruz, better known under his artist name Serrinha Raíz from Rio de Janeiro/Brazil and Chris Quade Couto from Cologne/Germany. Both leaders are experienced in playing samba percussion in various baterias, conducting baterias and thought samba music throughout the whole world. For the participants the organizers will cover Samba percussion workshops fee and 1 meal per day. All other costs won’t be covered by organizers. Individual and group applications will be received no later than August 12th via online application available on the web site. Samba percussion workshops will be traditionally held on Petrovaradin fortress . Sports and recreation club "Capoeira Senzala" from Novi Sad will gather visitors from the region and across Europe to attend free Capoeira workshops, which will be held at Novi Sad beach "Strand" as a part of the "Days of Brazil - Novi Sad Samba Carnival" festival to be held for the fourth time this year. This year almost 200 guests from Denmark, France, Slovenia, Italy, Croatia, and other countries in the region and the whole Serbia will be joining Capoeira trainings. Three-day workshops will be organized for adults, children and all those who would like to try out capueira skills and led by three respected masters of Capoeira. Training and the carnival parade, which is traditionally organized as the final event on the last day of the Festival, will lead Mestre Steen. The only master of Capoeira in the group Senzala who isn't of Brazilian origin, Steen Møller is founder of Capoeira School in Copenhagen, Denmark, which is working for over 20 years. Capoeira clubs in Belgrade and Novi Sad were established in 2001 under his aegis. Besides mestre Steen capoieira training will be led by Mestre Pulmão - Marcelo Santos, who is leading capoeira schools in Brazil, but also in Belgrade and Skopje and Mestre Banana - Claudio Marcio Silva, who leads the Group Senzala branch in Paris. Mestre Banana received a master belt this year and is one of the youngest mestre in the world of Capoeira. Knowledge on Brazilian culture and commitment evidenced in the mestre titles of the announced trainers promises great trainings, fun and spreading the spirit of Brazil throughout Novi Sad. Saturday August 17th is a great day to celebrate in Serbia and Brazil! If you wanted to swim at Copacabana beach, or try out carnival samba, drink famous Caipirinha, or play football with Brazilians you will finally have the opportunity to do it - without a visa! Agreement between Serbia and Brazil on the abolition of visa will start implementing from August 17th, when Serbian citizens won't need visas to stay in Brazil weather these are touristic or business purposes. On this occasion, as a part of Days of Brazil Festival , we are celebrating visa abolition at the Summer Cinema behind the Cultural Center of Novi Sad, starting from 9.00 pm and continue late into the night on the Petrovaradin fortress. Due to unforeseen circumstances, announced capuiera instructor Mestre Banana won't be able to lead this year Capoeira workshops within in the Days of Brazil festival.Capoeira workshops will be lead by two other announced instructors mestre Steen and mestre Pulmao. Organizers apologize to all registered participants for the Mestre Banana sudden cancellation.